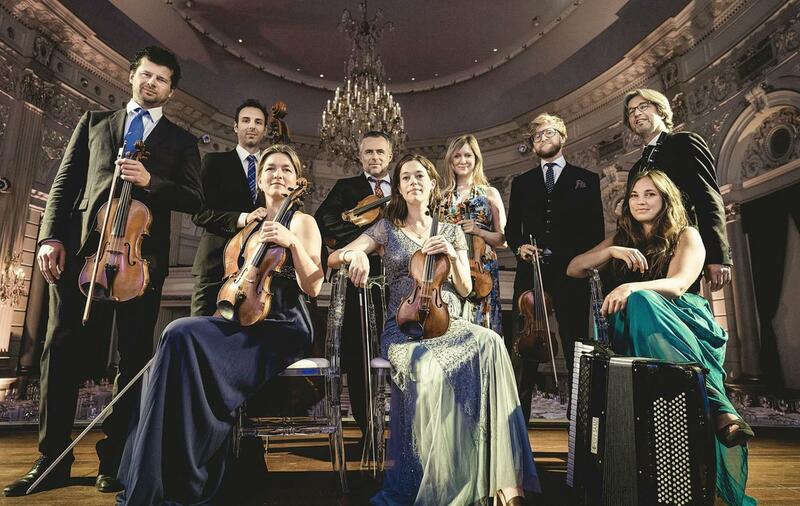 Members of Camerata RCO, an independent ensemble with strong ties to the Royal Concertgebouw Orchestra. Fontana will present a concert of Brahms, Mozart, and Dohnanyi by Camerata RCO on Thursday, April 18 at 7:30 pm in the Dalton Center Recital Hall at WMU. Cara Lieurance talks with violinist Annebeth Webb, who tells the story of how the group was started . It began not as a calculated offshoot of the Royal Concertgebouw Orchestra, but rather at the invitation of hosts who housed members of the orchestra on summer vacation in Italy. Webb explains that although playing in the RCO is a full-time job, the musicians still love to branch out with chamber music when they can. She helped organize Camerata RCO based on the interest and availability of her fellow RCO players. In her experience, the orchestra taught her how to interpret the musical languages of many composers - Brahms for example - through their symphonic works, which ends up adding a lot to how she interprets their chamber music. An interview with Annebeth Webb of Camerata RCO. On Saturday March 16, the Juilliard String Quartet will return to West Michigan to perform on the Fontana series. First violinist Areta Zhulla, the newest member of the group (she joined last year), tells Cara Lieurance that her roots with the Juilliard School and the famous quartet are deep: both were a primary source of learning and mentorship in her life. Zhulla introduces the pieces on the program (works of Haydn, Bartok and Beethoven), and they discuss the importance of regularly championing and commissioning new works for string quartet. The Juilliard String Quartet's concert is at the Dalton Center Recital Hall at Western Michigan University on Saturday, Mar 16 at 7:30 pm. The Liebeslieder Waltzes, or "Love Song Waltzes" by Johannes Brahms, were intended for gatherings of friends and family in an age when many people read music and played piano as a pastime, says Mikael Eliasen, Artistic Director of Curtis Opera Theatre at the Curtis Institute. These sung waltzes are at the heart of the Curtis On Tour program, which will bring four young singers to Kalamazoo to perform Friday, Feb 22 at 7:30 pm in the Dalton Center Recital Hall in a Fontana series concert. Eliasen and Cara Lieurance talk about his life training young singers at the Curtis Institute, and how he's enjoying Curtis On Tour, a newly-established program that brings together current students, alumni, and faculty to perform in concerts around the world. In a conversation about improvisation, American jazz pianist Cyrus Chestnut says he looks inside himself for something new every time he performs. It's a standard set by an early mentor, jazz singer Betty Carter, who demanded originality from herself and her players. Chestnut now divides his time between recording (nearly an album a year), touring, and teaching at Howard University. On Saturday, Dec 8 at the Dalton Center Recital Hall at WMU, Fontana will present Cyrus Chestnut and his quartet in a concert that touches on classical music, gospel, pop, rock, and particularly, music from A Charlie Brown Christmas. An interview with pianist Cyrus Chestnut. Branford Marsalis: "There's A Lot Of Things I Can Do... I've Chosen This." Cara Lieurance talks to Branford Marsalis about everything from his career moves, to today's jazz students, to the longstanding musicians in his quartet, to the books he's read lately (lots of history and non-fiction), in a preview of his sold-out Oct 26th show in Kalamazoo. The Branford Marsalis Quartet takes the stage at 7:30 pm at the Cityscape Event Center, in a concert presented by Fontana. An interview with Branford Marsalis. In the new Fontana season, jazz, art song, and classical music will fill a season spanning October 28, 2018 - May 11, 2019. Executive director David Baldwin joins Cara Lieurance to discuss each of the 8 concerts in detail.